OAK RIDGE, TN - The U.S. Department of Energy's (DOE) Oak Ridge Office (ORO) has initiated a series of controlled burns of grassland areas on the DOE Oak Ridge Reservation on the Tennessee Wildlife Resources Agency (TWRA) Three Bend Area off Pump House and Bull Bluff Roads, and other managed grassland areas off Bethel Valley Road and off Highway 58. • Dyllis kudzu control – approximately 10 acres of forest edge, grassland and kudzu. 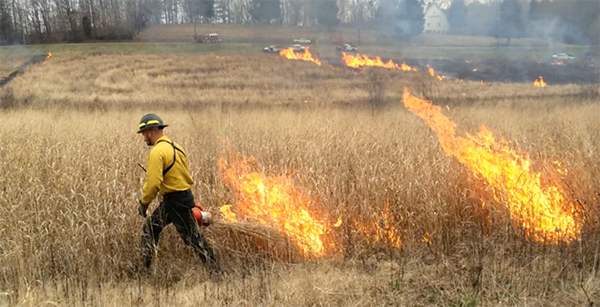 These planned burns are part of DOE’s efforts to provide wildlife habitat, encourage growth of native plants, and reduce the risk of wildfires. They are conducted and overseen by the State of Tennessee Division of Forestry (TDF) personnel who maintain fire control equipment, certified burn managers, and trained personnel at the burn area. Smoke may be observed in the Oak Ridge vicinity of Clark Center Park or south of the Oak Ridge Institute of Science and Education campus during the burns.